The Sai Symphony is an unique one based on the life of Bhagwan Sri Sathya Sai Baba and embodies His principal universal messages of Love and Peace for all Mankind, the call to Man to help and serve his fellow Man. Its messages are most appropriate to today’s strife torn world, bringing hope for the future of the Human race. It has been composed by Mr. Michael Herting, a German who had no previous awareness of Baba. It was first performed at Baba’s birthplace at Puttaparti, in the state of Andhra Pradesh in India on the occasion of Baba’s 90th Birthday on 23rd November, 2015, and again at New Delhi at the Nehru Indoor Stadium on 28th November, 2015. The Orchestra was conducted by Dr. Michael Koehler, a German associated with the Leipzig Philharmonic. The Orchestra and choir consisted on 126 musicians from 16 countries: Italy, France, Russia, Ukraine, Japan, USA, England, Germany, Japan, Mauritania, Senegal,etc. 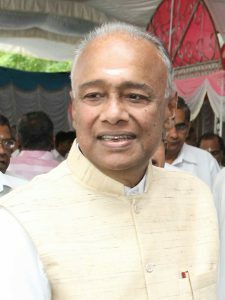 Leading Indian artistes from India also accompanied the Orchestra as soloists. All the artistes performed probono as a gesture of their belief in what the Symphony stands for. The Symphony is in five parts, each one reverberating with love and passion for the Human Race and is an unique blend of Western and Indian Classical Music with seamless integration of the different forms and sounds.Its principal themes are “Love All, Serve All”, “Help Ever, Hurt Never”. Sai Symphony is a composition from German composer Mike Herting, commissioned by Sathya Sai Organization for Sai Baba’s 90th birthday celebrations. It describes and relates to Sai Baba’s life and His teachings. This huge work is written for Symphony Orchestra, Choir and thirteen soloists from India, Africa and Europe. 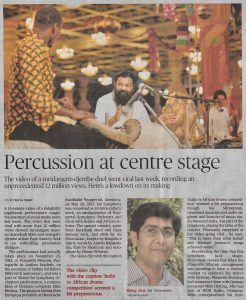 It has been played for the first time in Puttaparthi, during the celebration of Sai Baba’s 90th birthday and has been enthusiastically received by a huge crowd of several ten thousands of listeners. The music combines the best of various cultures and features some of the best musicians of the world. 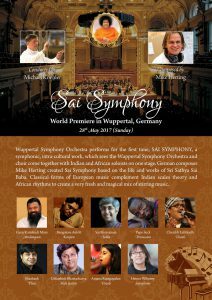 On may 28th 2017 Sai Symphony will see its international premiere in Europe, the first time out of India. The professional city orchestra of Wuppertal together with the city choir and the renowned soloists will render an excellent performance of the Symphony in the beautiful historic Stadthalle Wuppertal, a very special event. I am very happy about this unique collaboration of musicians from several continents, celebrated completely in the spirit of Sai Baba’s words: Love All, Serve All; Help Ever, Hurt Never!